Sell to Us Price: $640.38 each. 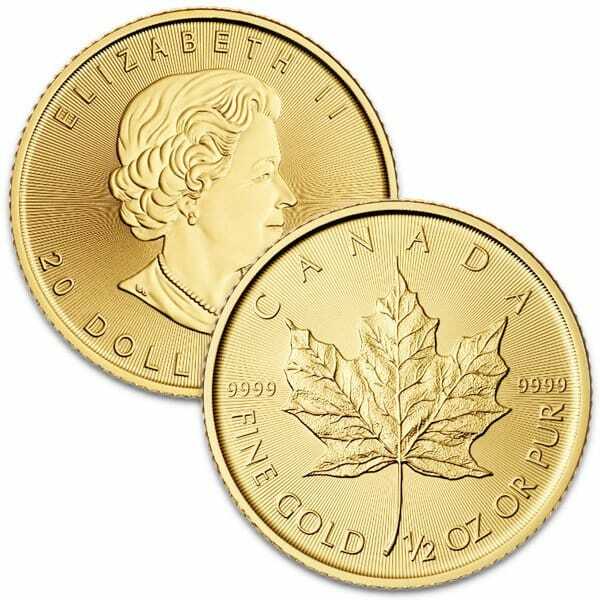 Released in 1979, the Canadian Maple Leaf coin are the official gold bullion coins of Canada. 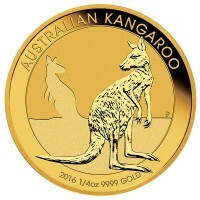 These half ounce gold mint bullion coins for sale are beautifully struck with a gold purity of .9999 (24 karat) and contains no base metals. 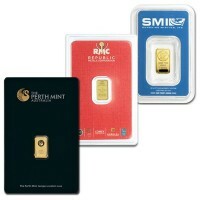 Money Metals Exchange also offers the Canadian Maple Leaf gold bullion coins in multiple sizes as well. 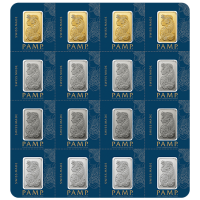 (1 oz, 1/2 oz and 1/4 oz) It's a great investment for investors wanting the recognizability of a government issued coin for a low price. Queen Elizabeth II (obverse) - The bust of Queen Elizabeth II appears on the obverse side of the coin. Originally, the Queen's image was that of a younger woman. 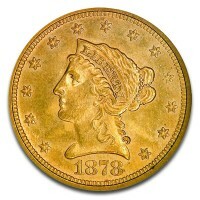 In 1990, her image was updated to a more mature version. 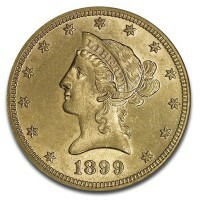 The coin includes the face value and date of its mintage. The words "Elizabeth II" can be seen prominently above the Queen's portrait. Canadian Maple Leaf (reverse) - The reverse depicts a single and highly detailed image of the fractional gold Maple Leaf. It also includes the purity and country. 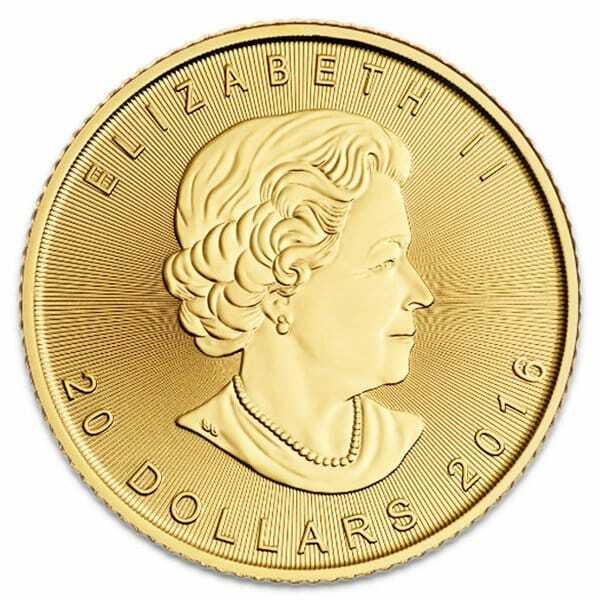 Your questions about the 1/2 oz gold Maple Leaf coin or any of our other Canadian gold coins can be answered by calling Money Metals Exchange at 1-800-800-1865. 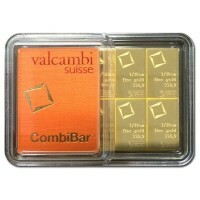 Our current buy pricing is $640.38 each and we will buy up to 20 ounces at this price. Simply call us on any weekday to lock pricing at 1-800-800-1865. 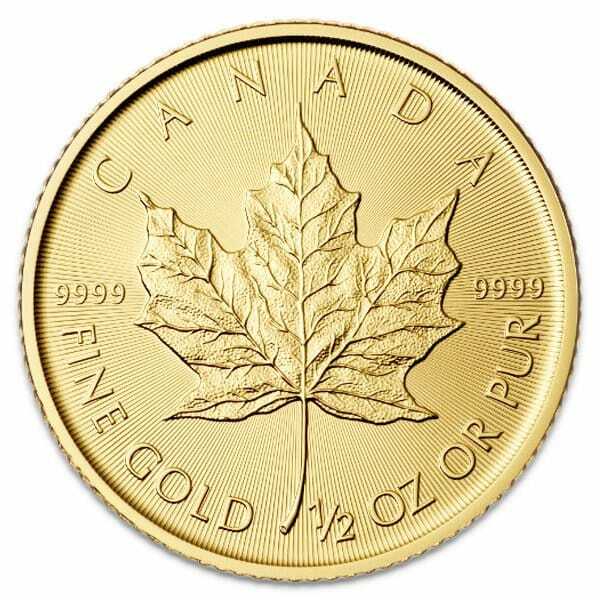 You can now sell your 1/2 Oz Canadian Gold Maple Leaf Coins back to us online, at a price of $640.38 each!